Note: McFatty Monday's is no longer! Instead I will post Momma's Monday Check-in. Join me as I eat and exercise my way through the next 8.5 weeks. Sleep: Decent. Roscoe's back in his own bed and after a few nights of 4 and 5 wakes, his sleep has improved a lot. It's nice to be back in my own bed, alone, with Andy (and my many support pillows). I can't live without: Knowing that the end is near (sort of)! 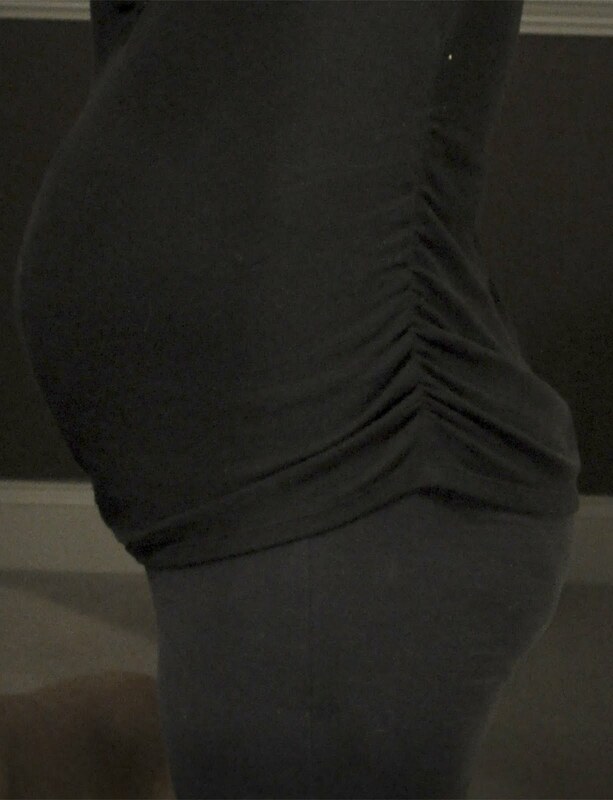 I've been feeling trapped in my own body lately, and it helps to know that this pregnancy won't last forever. I miss: (and I think Roscoe misses) more lap room. I am looking forward to: A 32 week prenatal appointment on Friday, and Andy has the day off so he gets to join us. Andy and I have a hot date on Sunday night, and the Bradley Babies Toddlers' annual Valentine's Day party is on Sunday. Best moment this week: I learned to de-bone a chicken!! Such a simple and useful thing to know how to do. We also finished the nursery, although something is missing and I have yet to figure out what. When it's truly complete I'll devote a whole post to the baby's new room. Aha Moment: I finally noticed my linea nigra. Maybe I've just been too busy to look for it, and it seems a lot lighter than last time. It's also really crooked. Milestones: Only five more weeks of work, and so much to do! Movement: I've actually been enjoying his movement more recently. I think it's because he feels so big and I can easily make out his baby parts. His feet have been front and center. Exercise: I lifted weights last week and made that the focus of my workouts. Even though I felt big, I felt strong too and that inspired me to keep at it. Diet: I only gained 1.5 pounds last week...not 2! Goals for the upcoming week: Workout twice, enjoy Roscoe while Andy is on his overnight Vegas trip (for business), and have a fun-filled family weekend. Labor Signs: More light cramps. your belly is too cute!! I totally understand "feeling trapped in your body." You have a good attitude about it though...it won't last forever! I wish I could be that optimistic. As much as I want my baby to stay put and keep growing, I am so anxious to NOT be pregnant anymore. Sometimes it really does feel like FOREVER! I had linea nigra with my first and didn't get it this time. I actually forgot about that until I read about it in your post. It feels like forever since I last saw you! Your belly is def. bigger now! I miss you!